Large Master Bedroom, Bathroom And Family Room, Gorgeous Kitchen And Gardens. The Cedar Suite is a well appointed guest home that offers a uniquely private vacation experience in Greenbluff, Washington, just 7 miles North of Spokane and adjacent to the beautiful Cannon's Edge Event center, and between several u-pick orchards and farms. Whether you are enjoying the local harvest festivities or have just tied the knot, The Cedar Suite is your perfect destination! This gated property offers panoramic views, luxury bedding, 8 person spa, 7 marked parking spaces, large screen TV's, surrounds, cable, blueray players for movie watchers, and gardens that are so peaceful to relax in. We have tried to make this a place that has all the high end amenities of a very nice hotel and yet felt as cozy and inviting as home. The Master Bedroom is large and private, with garden views and access, tall formalwear closets as well as a vanity with magnified lighted mirror for getting ready. Wall mounted tv/blueray/cable/sound set-up for those who love to watch TV or movies in bed. A new tempurpedic king bed and luxury bedding make for a great night's sleep for two. Down alternates are available for those who have allergies. Spa robes are provided. Luxury towels, spa towels, shampoo, conditioner, lotion, bodywash, barsoap, hairdryer, and more are provided, as well as a lockable safe. The large living area comfortably sleeps six with new and comfortable beds and linens. Cozy sofa seating perfect for snuggling up to the ambient electric fireplace or your favorite movie on the large entertainment center with surround. Murphy style queen wall bed with a new Belagio mattress sleeps two, and the sofa- ottoman configuration with a memoryfoam full sized bed overlay that sleeps another two comfortably. Two roomy twin built in bunk beds with memory foam and luxury bedding accommodate another two guests, there's a dimmable reading light and even an outlet in each space to charge up your phones. Free high speed wireless internet throughout. New washer/ dryer for guests laundry, laundry supplies, clothing steamer, iron/board are all in suite. The kitchen is well equipped with a side by side refrigerator- freezer and filtered water and ice in the door. Oven, microwave, stove and hood, dishwasher, and disposal. It has many small appliances, and gadgets to provide gourmet meals for your group. complete tableservice for 8+ as well as wine, beverage, glasses and coffee cups, and oututdoor plastic table service as well as disposables are provided so you can enjoy eating outdoors or enjoy your fixin's right off the BBQ. Coffees, teas, and vanilla creamer are complimentary for you to prepare and enjoy at your leisure in the privacy of the suite's fully equipped gourmet kitchen. The spa, gardens and yard are the perfect place to unwind and relax or take in one of our famous sunsets. Retractable awning with remote, cozy outdoor lounge to take an afternoon nap or find your favorite constellation! Ample outdoor dining and seating with benches in two spots to enjoy the flowers. Families; The Cedar Suite has a brand new adjustable highchair, a brand new pack and play (infant through toddler) with changing table, baby blankets and linens, and toddler eating utensils and bibs, to make your trip easier. A large selection of board games are in the suite, and a larger selection of toys (lego's, playmobiles, marble maze, and many more) available at your request, list is in the suite. A large list of movies and video games in the suite. We wanted to make this a place you could come stay and enjoy yourself with family or friends with just your clothes and bathing suits. With the exception of your lunch and dinner items, Everything you need is in the suite! If you decide you want me to stock the suite with your favorite foods or special items prior to your arrival, I can do this for a fee of $25, provided it takes me just one stop, plus the cost of your items. While the Cedar Suite is not a wedding or ceremony venue, I have had the opportunity to work with many wonderful brides and their families who want to enjoy the accommodations before and after their ceremonies, or let their out of town family members have an enjoyable stay at the suite while they are in town for the occasion. I have also had the pleasure of hosting many honeymooners, and I have already seen them return for their anniversaries, to say it is an honor is an understatement! I am so very blessed! My family keeps me very busy, I feel I can relate to the constant changes and busy life that most of our guests are leading. I have had so much fun in creating The Cedar Suite to be a place they can totally relax, feel pampered and enjoy themselves. I have tried to provide everything they might need in a beautiful atmosphere, and to make it as easy as possible for guests. My love and dependence on coffee explains why I have two different kinds of coffee makers in the suite! I love anything that requires creativity, whether it's cooking, writing, sculpture, gardening or anything else. I enjoy traveling and camping, but I must admit, I really like my creature comforts, the more it feels like home, the better. We live on the property so we keep it very well maintained and very clean. We are available anytime to assist wherever we are needed, but we try not to get in the way, and assume that guests come to The Cedar Suite for a quiet retreat to rest, having a unique space that is all their own to visit and reconnect with each other. We are situated right in the middle of several u-pick orchards and family farms on the famous "West loop" in beautiful Greenbluff. The festivities here have become tradition and right of passage for local families and visitors. Greenbluff is a the perfect place to create great memories together! 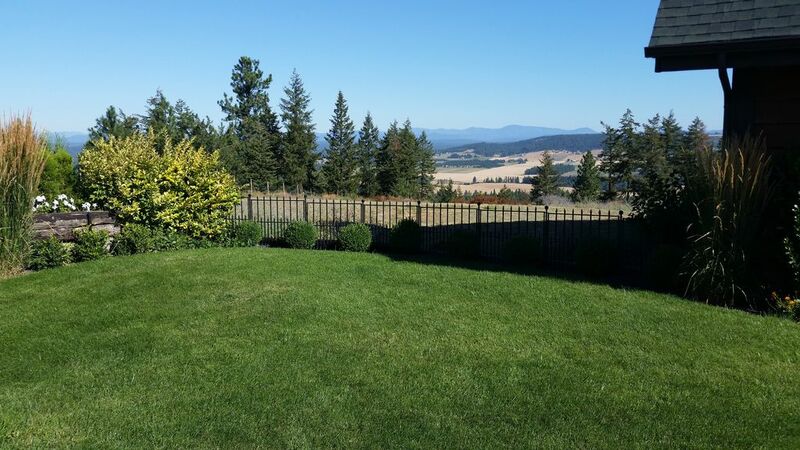 The view from this property never gets tiresome, on a clear day you can see into Canada! Not too far to all the Northtown amenities and just a bit further to all the great amenities and attractions of downtown. We can see the weather come into the Deer Park area, or we can be just above a blanket of fog that makes it seem as though it is a lake from here to Mt. Spokane. Living out in the country is a wonderful thing, and the occasional elk and bald eagle sighting is the icing on the cake! I would say that guests who visit are blown away by the views and gardens, and everyone loves the spa! The gardens make a perfect backdrop for pictures. The inside of the suite is very inviting and has a great layout to enjoy a family get together or a romantic getaway. The Cedar Suite was designed to work well for a group or just one or two travelers. Slate shower with bench, ample towels supplied for stay in under sink vanity, in-line hot water, extra hooks for drying towels and swim-suits. Blow dryer and essentials such as TP, salon quality shampoo, conditioner, lotion and bodywash, bar soap, handsoap and more are provided. The Cedar Suite is a uniquely private fully furnished guest home situated right in the heart of Greenbluff Washington, adjacent to the beautiful Cannon''s Edge event center. Fully equipped kitchen. Panoramic views of the Selkirks, Mount Spokane and the Spokane Mountains. Northern views on clear days to Canada! Forced air conditioning, powerful and adjustable to the exact temp you want with electronic thermostat and climate control settings. Forced air, immediate heat when you need it. Adjustable climate control keeps you cozy warm. Clean high quality linens on all beds, ample clean stand- by linens in suite in case they are needed. Stacked washer/dryer for guests own personal use. Electric stacked washer/ dryer for guests own personal use. Ambient electric fireplace is amazingly realistic and just the thing to snuggle in front of when the evenings chill down. Seven marked spaces avaialble, please no parking in front of any garage or rollup doors. Free high-speed internet with your stay. White high quality resort and bath towels, washcloths, hand towels are provided- more than enough for your stay and more upon request. Kitchen and clean-up towels too. This is the family room indicated in the pictures. It is very spacious, cozy and comfortable, it has the wall bed, bunk beds and the sofa/bed. Bosch stainless steel, quiet and high capacity. Detergent included. Samsung stainless steel large capacity side- by side fridge/ freezer with filtered water and ice in door. Four burner electric smooth ceramic surface. Large capacity browning microwave, can cook medium pizzas. Keurig and automatic drip coffee makers. Service for 8 in ceramic dishes, wine, champagne and beverage glasses, coffee mugs, flatware, outdoor non- breakable dishes and cups. Serving bowls, platters, trays and more. Beautiful gourmet kitchen has an open design ideal for visiting with your group while you cook. Pots, pans, small appliances galore, gadgets, utensils, and serving ware. Dining table seats 6 and bar with stools just adjacent to table seat and extra 2. Outdoor dining areas in same configuration with sturdy tables and umbrella. Please eat only in the kitchen area. 65" LCD flatscreen HD TV, 3-D, internet with surround sound in family room as well as 26" HD flatscreen in master bedroom with soundbar. Beautiful pictures on both. Dish premium with movie channels and pay per view capability. Pay per view movies will be billed to you at the rate they appear on the screen- I don't mark them up. Pioneer receivers, Bluetooth and USB compatible- bring your flash drive or use your phone! 2 Blue Ray, 3D, and traditional DVD player combo's in master bedroom and family room. In suite: magazines, 6+- novels, Holy Bible, list coming! Sorry, Monopoly, Pictionary, Trivial Pursuit, Clue, Scrabble, cards, Pinochle, and more- list inside Suite, or contact me and I will email it to you, then whatever you select will be waiting for you! Lots of Legos, Playmobiles, marble maze, stuffed toys etc. Available on request. Too many to list here. List in Suite, or I can email it to you so your selections will be waiting for you when you arrive! Several for x-box and several for the Wii. List inside Suite, or contact me for the list and I will email it to you so that whatever titles you select can be ready upon your arrival!. Large deck and patio to enjoy yourself outside, lots of seating and places to lounge. Retractable awning and umbrella to keep you cool. Deluxe therapeutic 8 person Sundance spa with deep tissue massaging back, neck and foot jets. Colorful light show and waterfall! We really enjoyed the stay. The house was warm when we arrived. We we're very comfortable the whole time...the bed is amazing! Our bridal party loved this spot to be able to prepare for the wedding and take some photos. The house is decorated nicely and is clean. Cozy and inviting. We loved this place for our girls weekend!! We loved the place and was so clean and nice!! So glad you enjoyed your stay, hope to see you again soon! John and Sharon were an absolute joy to host, they were extremely considerate and left the place in superb shape. We look forward to seeing them again! My wife and I enjoyed our stay so much we went for walks to the farms in the area and just relax in the hot tub and on the front porch. Rates are subject to change without notice until reservation is confirmed. Reservation is confirmed when a signed copy of the Terms and Conditions of Agreement is received. Guest agrees to furnish valid credit card information in lieu of damage deposit (similar to most hotel policies).